From the most expensive Christmas tree ever decorated to the largest group of carolers ever gathered in person, these world records prove that some people are willing to go the extra mile to show off their Christmas spirit. Join in the holiday cheer with these Christmas-themed Guinness World Records. Wearing different colored shirts, 2,945 people gathered together in Honduras to form the world's largest human Christmas tree. Set by the Godswill Akpabio Unity Choir, 25,272 people gathered at the Uyo Township Stadium in Nigeria to sing Christmas carols including "O Christmas Tree," "Joy To The World" and "O Come All Ye Faithful." Think you're spending a lot on ornaments this year? Then you need to check out this expensive Christmas tree. Covered in over 180 items of jewelry, the 43.2-foot-tall tree situated at the Emirates Palace hotel in Abu Dhabi, United Arab Emirates was valued at over $11 million. A whopping 18,112 people dressed up in Santa outfits at the Nagar Saktan Thampuran Ground in Thrissur, Kerala, India to raise money for the poor. The event was organized by Thrissur Citizenry & Thrissur Archdiocese. Brazilians paddle past the world's largest floating Christmas tree on December 21, 2014 in Rio de Janeiro, Brazil. 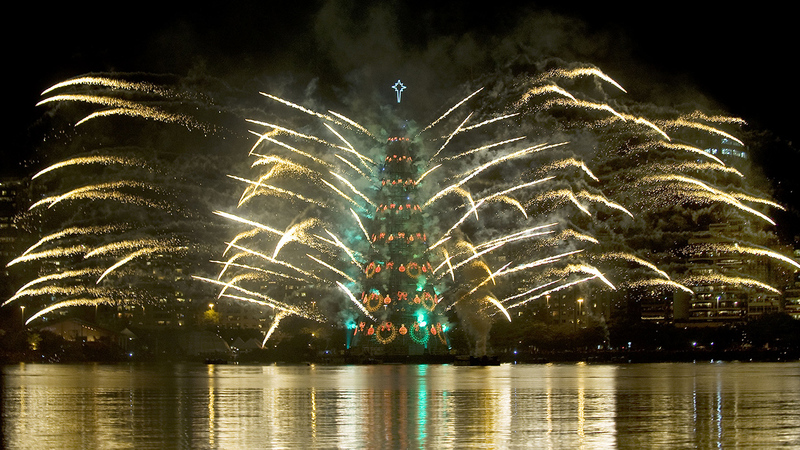 The lighting of this massive tree has become an annual holiday tradition for residents of Rio de Janeiro. Measuring nearly 279 feet in height, the tree is adorned with 2.8 million micro-lamps and 22.99 miles of luminous hose. Comprising turkey, carrots, potatoes and other hearty ingredients, this meal from the Duck Inn in Worcestershire, United Kingdom holds the record for largest Christmas dinner. The meal is free for anyone who can eat it in 45 minutes.